Heat oil in a frying pan, add green chillies fry, add onion and garlic fry them till they turn brown. Add Tomato ketchup mix well. Add chili sauce, mix well and fry for few mins. Add soy sauce and vinegar mix well and add water mix well. Add corn flour mix well. Cook for few minutes or till it become slightly thick. Switch off the stove and keep aside. 1. Rinse the florets of cauliflower 2-3 times and soak it in salt and vinegar water for 30 minutes. Rinse one more time. 3. Heat oil in a pan, dip the gobi/cauliflower florets into the batter and deep fry them until brown on low to medium heat. Remove and place them on paper towel. Heat Part 1 for 2 minutes, switch off the stove. Add part 2 deep fried cauliflower/gobi into it. Add chopped cilantro and mix well. 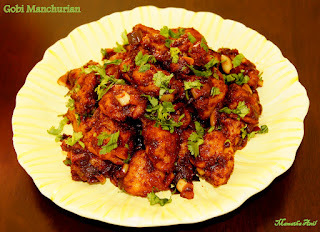 Yummy Gobi/cauliflower manchurian is ready to serve.